After a two-year, sold-out, worldwide tour, Conner4Real (Andy Samberg) is the biggest name in music. Then the unthinkable happens - his second album flops. In the midst of a popularity crisis, who can Connor trust? The celebrity comedy cameo (or CCC as no one is really calling it) has become an all too familiar device in film comedies. Any movie that features a consistent flow of ‘real-life’ stars (all keen to prove that, yes, they are so in on the joke) smacks of desperation and is enough to raise some serious alarm bells. However, entertaining music satire, Popstar: Never Stop Never Stopping, from producer Judd Apatow and American comedy trio, The Lonely Island, manages to make the CCC feel fresh and funny once again. Featuring classic moments from some pretty impressive names in music (including Ringo Star, Usher, 50 Cent, Seal and Mariah Carey) and comedy (such as Sarah Silverman, Joan Cusack, Maya Rudolph, Will Arnett and Bill Hader) Popstar is a sharply observed, often outrageously funny spoof. The stage managed, over produced pop music industry may seem like an all too easy target. However, many of Popstar’s hilarious music sequences work because of how close they are to reality. Conor’s song lyrics are brilliant - watch out for some seriously dangerous ear worms. Meanwhile, the film also turns its satirical eye on the media (the TMZ spoof scenes are great) and our growing habit of oversharing on social media sites such YouTube. While Popstar follows a fairly predictable path and doesn’t come close to the standard set by Spinal Tap (what film ever could), this is a funny and entertaining comedy with surprising sweetness at its heart. 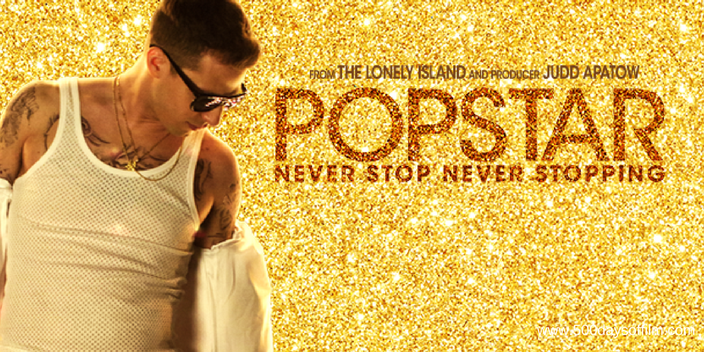 Have you seen Popstar: Never Stop Never Stopping? If you have, what did you think of this movie? Let me know in the comments section below!